To protect you and your family membars ! 80 percent of deaths happen at home, and about 50 percent of those deaths occur due to the delay in detecting fires. Installation oｆ the fire alarms has been required in all residences in Tokyo since April 1,2010. We are promoting Residential Fire Alarms with this campaign song. It's my family's smoke alarm. It's always ready to keep us safe from harm. It can warm us in case there is ever fire. We can hear the alarm and we can escape. If there's ever fire, we hear it beep,beep,beep. Then we know our smoke alarm will wake us from our sleep. It protects us all the time. 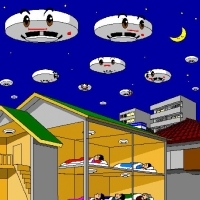 Our UFO is our smoke alarm. If it feels heat or somke it raises an alarm. We pull it's tail so we can check the battery. It watches us night and day while we sleep or play. If there's fire, we hear it beep,beep,beep. Click to enlarge the photos and illustrations on the right side of the page. copyright © 文化と防災の合体 Incorporation of Culture and Disaster-Prevention some rights reserved.